Yes, I am being totally egotistical with the title and the content of today's blog. January 22, 2018, is, of course, the night WWE celebrates Raw 25. In January 1993 Monday nights changed forever when Prime Time Wrestling transitioned from a pre-recorded studio format to live (and live to tape) pro wrestling action and sports entertainment. 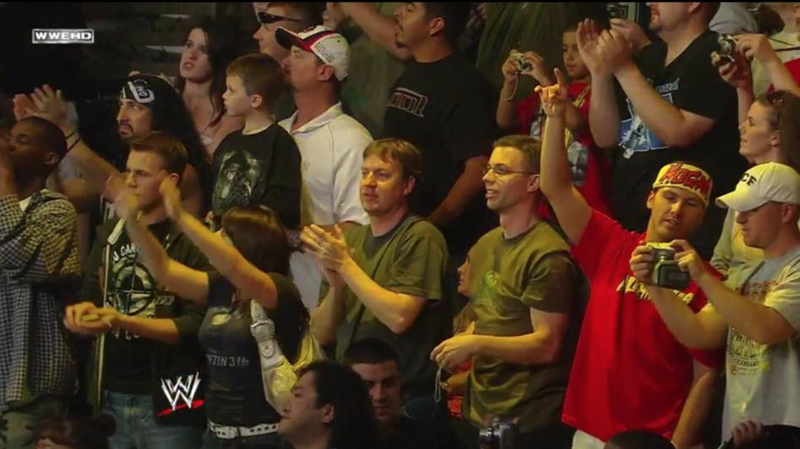 Of the 1,286 episodes of Raw that have already aired, I have appeared on two of them. I should also give credit to my favorite wrestling buddy, Chad Smart too. It was with him that I attended my very first Raw on January 8, 2007. Chad and I worked together at the time and we were joined by a fellow co-worker, Randy Livingston. Chad and I attended WrestleMania 22 the previous year and dressed as the Spirit Squad, so we wanted to keep the cosplay tradition alive. The three of us decided on the "3 faces of Hogan." I already had the old school red and yellow Hulkamania shirt. I cut up an old t-shirt and created a bandana and bought a yellow mustache to complete the look. 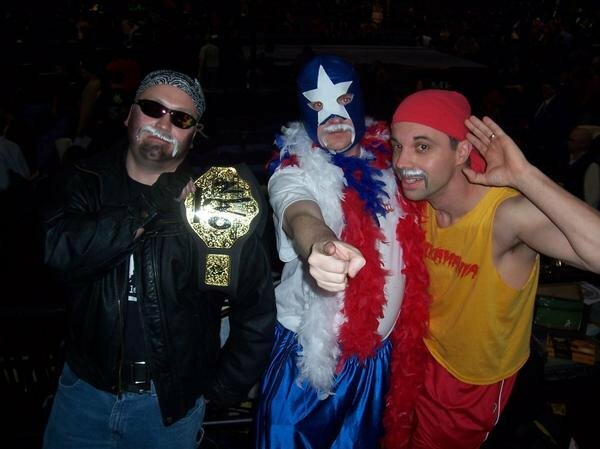 Randy went as "Hollywood" Hogan from the nWo and Chad got patriotic as he brought Mr. America back to life. The costumes looked pretty good if I do say so myself. Little did we know we'd end up in the opening shot when Raw went live on the USA Network that night from the Scottrade Center. 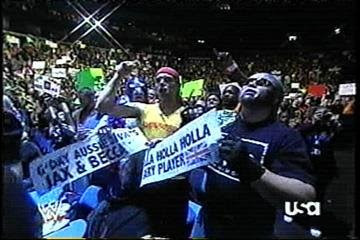 We were holding signs in honor of our Australian friends we'd met the year before at Mania. The following year, Chad and I attended WrestleMania 24 in Orlando. That's the night Ric Flair retired. On a whim, we decided to get tickets to Raw after learning the Four Horsemen were going to be at the show. Much to our surprise, we walked up to the ticket window and got two tickets on the opposite side of the hard cam and pretty close to the floor. The best part, the tickets were only $50 each. Being at the show, we had no idea if we'd be on camera. This was at a time before either of us had a smartphone or a Facebook account. I believe one of our former coworkers called Chad that night on his flip phone and informed us we'd been on the air. Because it was a big celebration for Flair, we are in several of the shots of the "Ric Flair: The Definitive Collection" DVD. In recent days I've been tagged and texted with screenshots from the WWE Network. We've been to a handful of other Raws since then, all the night after WrestleMania. Now that I think about it, that night in January 2007 is my only non-WrestleMania weekend Raw experience. It's fun to be there live and I've love to be in New York this evening watching in person, but I'll enjoy the show on DVR. Oh and listen to our top six moments from Raw here.